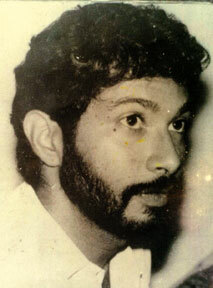 At the time of Richard de Zoysa’s death in February 1990, a month before his thirty second birthday, he had for long been established as the most promising of Sri Lanka’s young English language poets. Therein of course lies a seeming paradox: a long period of promise implies that it was not fulfilled. This is sadly true. There are just over thirty poems included here, and these represent almost all that Richard produced. There was at least one other very late gem, about his work in Jaffna along with Waruna Karunatilleke which he gave me for possible publication and then took back; but that unfortunately I cannot now trace. Apart from a few like that, and some others that were published in his school magazine (which have not been included, because he would undoubtedly have wanted them revised into better final form), Richard wrote no other poems. From the point of view of Sri Lankan letters in English, this is tragic. The fact however is that Richard lived a very full life in a great many dimensions: he was actor and drama teacher, journalist and broadcaster, human rights activist and political and social thinker. In accomplishing as much as he did in those various spheres, he devoted much less time to poetry than was desirable from a purely literary standpoint; and even sadder than this was the fact that his commitment to one or more of these areas led to his murder at the hands of paramilitary forces unwilling or afraid to have their conduct or his openly scrutinized. The point one needs to make here however is that, even though art was the loser, Society from Richard’s point of view was the intended beneficiary of all else he did. Since he saw art too as being primarily justified by its social goals, there is the less reason to regret the diffusion of his energies in so many other directions. all mark out an intensity of wide social awareness that was shared by few other writers of the time. ‘Animal Crackers’, the poem that a couple of years later was joint winner of the New Ceylon Writing prize for poetry that emerged from the 1983 riots, is perhaps his most assured piece in this respect. The slow development, from playing with a child (based on a very real experience at the time) to recording the plots and the passions that affected so many interest groups, succeeds admirably in conveying the imperceptibly increasing horror of that period. Notable too here is Richard’s animal imagery in describing Tamil extremists, Sinhalese chauvinists, and the government involvement that set up the blaze. Animal associations were not of course Richard’s invention, Tiger and Lion and Elephant (though not jackal) being used by the groups themselves as identification. The juxtaposition here however, with its sudden invocations of brutal and callous reality, illuminates vividly the situation that obtained. Shortly before that poem and these troubles, Richard had already used the image of the elephant to convey what was building up, in ‘Gajagavannama’, his evocative account of an incident that occurred in February 1983. In an author’s note he penned later for an anthology, he mentioned directly the connection with the July riots; but it should be noted that the poem had been written a couple of months earlier, being based on his awareness, from trying to help the ruling party with its 1982 referendum campaign to extend the life of Parliament, of how ruthless, albeit still on the surface restrained, that party had become. The use then of the riotous elephants of February to foreshadow an increasingly dominant fact of life in this country was immensely powerful. The two political poems penned nearly five years later display a different facet of Richard’s sensitivity. The animals in ‘Birds, Beasts and Relatives’ are not symbols used to allocate political responsibility, but are introduced rather to convey Richard’s despair at the violence that was springing up on all sides to distort fundamental humanity. ‘Rites of Passage’ on the other hand is a more personal and personalized cry. While capturing the more and more restrictive transitions the nation underwent in the period it spans, it also characteristically suggests the sympathy Richard felt for members of the regular armed forces. Having done some work for them in the preceding period, and in particular during the offensive they launched in the Vadamaarachchi peninsula in May 1987, he had begun to feel that they were increasingly being treated as fodder, by a government that kept on redefining the enemy without any principles that the average soldier in the field could empathize with or even comprehend. In this respect my major regret with regard to this book is that I cannot trace now the poem he wrote about the Vadamaarachchi offensive, for Waruna, whom he had worked with, and with whom he had flown to the front. It caught most movingly both the exhilaration and the sense of imminent loss attached to a struggle to which, however briefly, it seemed to him commitment was possible. Richard’s faculties of social criticism addressed other areas too, as can be seen from the haunting ‘Lepidoptera’, written at a time when he was keenly aware of deficiencies in the educational system that prevailed; and also from the title poem, ‘This Other Eden’. Richard himself was no prude, and was indeed very free in his own personal conduct as well as his responses to other people, but exploitation was something he always found repugnant. As remarkable here however as his depiction of the predatory foreigner, at a time when the country was being touted as a cheap paradise for homosexuals, was the imagery he used with its Classical and Christian connotations. And this is the more interesting because it echoes his first major published poem, ‘Good Friday’, which recreates so movingly a mind in the throes of suffering, but conscious and confident of future justification. ‘This Other Eden’ is far more diffident in tone. For that very reason, the underlying sense it conveys of inner strength and resistance is to my mind even more powerful. It is that capacity to hold an inner core inviolate that informs too the elegies he wrote, which sprang often but not invariably from his own romantic attachments. To this category belong the two ‘Corporation Love Songs’, about his time at Rupavahini, the State Television Corporation, as well as a couple of the hitherto unpublished poems that appear here. Vivid as are the sentiments conveyed, and skilful the techniques employed, it is the sense of restraint that comes out most strongly here, the sense of the emotions in question being observed by a detached self. And substitute the Phoenix for the Turtle. If not quite as important as the subject matter of his poetry, certainly worth noting (especially at a time when not only younger aspirants were, almost all, writing in a free form that paid little attention to rhyme or rhythm) was Richard’s technical skill. His own thorough knowledge of and concern for the best in English Literature made him an adept at understanding the potential of various verse forms and rhyme schemes. His knowledge not only of terms but of what those terms meant and what various usages could convey was unique for someone of his generation. Sitting with elbows on the batik cloth. Equally, he was concerned about forms, and enjoyed experimenting with them; it is certainly a pleasure to view him compressing his thoughts into quatrains, as in the splendid satire “Talking of Michelangelo”, or in carefully crafted but ostensibly throwaway pieces such as ‘I’d like to grab your wayward heart’. In this regard it is worth registering how often he revised his work, frequently rethinking what his original inspiration had dictated – as can be seen from the manuscript of ‘Gajagavannama’, which is fortunately still preserved and has been reproduced here, immediately after the version that was finally printed. Most remarkable perhaps in terms of craftsmanship were the sonnets he produced, and though he was rarely satisfied with these (the note on the ms. of ‘Last night I cried…..’ reads “As usual the couplet is a dead bore. The rest is quite fun, don’t you think?”), they are still pretty remarkable exercises in discipline and controlled thought – as are indeed the two parodies he produced for the satirical magazine Between the Lines, ‘Colombo 1981’ and ‘Broken Promise’. Such exercises proved invaluable for the free verse too, in that in those poems too the rhythms and the rhymes that are used are assured and consistent and contribute immeasurably to the thrust of the work. The sudden spondees and half rhymes of ‘Apocalypse Soon’ for instance reinforce the sharp contrasts that are drawn, while the manner in which the various animals in ‘Animal Crackers’ are conveyed through rhythmic changes certainly helps to create the vivid atmosphere of the piece. Things happen near dawn that happen nowhere else. and of course the evocative baila rhythms of the opening stanza. Certainly there is no question but that, unlike for some of the new writers in English who have been emerging recently, English was for Richard his first language. Given however that previous poets of a similar background had relied almost exclusively on Standard English forms and images, his own capacity to blend those with Lankan usages too marks his distinctive breadth. In the end however, important as these features are, we return to what seems to me the most important aspect of Richard’s poetry: the subjects with which he dealt, and the thoughtful commitment that their wide range indicates. Of course Richard himself was well aware, as ‘Talking of Michelangelo’ makes clear, that writing that was indicative of social awareness was not necessarily a mark of commitment. That fact however is what reinforces the point made above, that we should not regret the relatively modest output of poetry, which is all we have. There are other writings too, on an even wider range of subjects, didactic and critical, and I trust some of them at least will be reproduced in a more enduring form. laden with relics, talismans and things. that prisoned and demanded patience from them. and lumbered forth towards the gates to storm them. and men to trees. Vehicles clambered walls. the roaring of the bloodstream of Colombo. knows behemoths, aroused, will rule by riot. to jungle law, in hope of peace and quiet. In February 1983, some elephants brought to Colombo for the Navam Perhera held by the Gangarama Temple broke free from the makewhift stalls where they were tethered and ran through the streets of Colombo. Boring me to the quick, piercing my soul! the lamp burns low, tomorrow needs refilling.